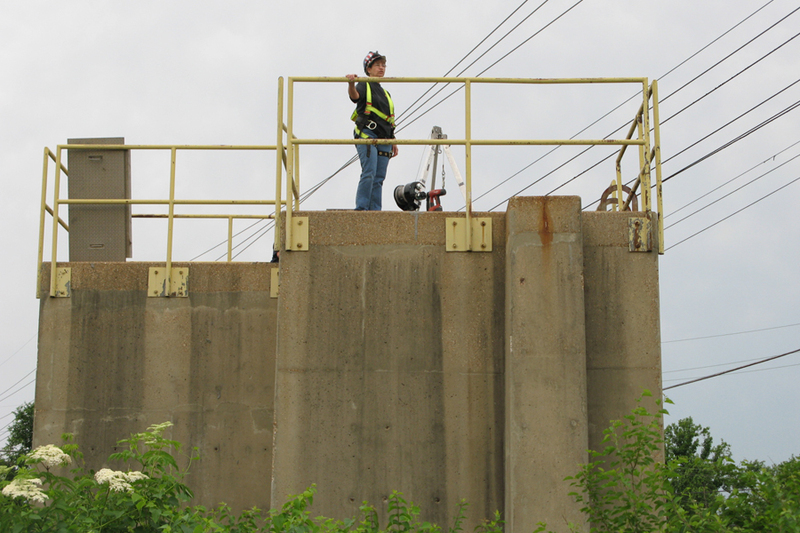 In 2000, one of the Metropolitan St. Louis Sewer District’s major sewer structures, the Maline Drop Shaft, had been so severely degraded by microbiologically induced corrosion (MIC) that structural failure was a very real possibility. This would have been a disaster for all the obvious reasons, not least the proximity of the Mississippi River and Chain of Rocks Bridge. At the time, there was no obvious way to rehabilitate the drop shaft that would structurally restore it and also prevent future MIC damage. Even replacement of the Maline Drop Shaft—which would have cost up to $4 million—would not necessarily have eliminated MIC. The district ended up rehabilitating the shaft with Permacast—a new technology based on a spray-cast concrete system—mixed with an antimicrobial additive called ConmicShield. At the time, it seemed like a fairly radical experiment—St. Louis was one of the very first sewer districts to apply ConmicShield in such a large-scale project. But 18 years later, the Maline Drop Shaft is still in good shape. It is structurally sound, and there appears to be no MIC damage of any kind. The Maline Drop Shaft is a roughly 10-by-8-ft concrete shaft about 50 ft in length; more than 20 ft of this is below grade, with 36- and 40-in. inlets and, at bottom, a 60-in. outlet feeding Bissell Point, one of the district’s oldest and largest treatment plants. For flood mitigation reasons, the shaft is built up 20 ft above grade. Its walls are approximately 18 in. thick—or they were when the drop shaft was built. In 2000, the Maline Drop Shaft was 40 years old, and looked much older. For much of the year, flows are not especially high and conditions are not good for Thiobacillus, the acid-producing bacteria that put the “corrosion” in MIC. Several times annually, flows create so much volume and turbulence that several feet of churning water will be in the bottom of the shaft for days at a time. This churning water, which is oxygen-rich and full of organic matter, is ideal for the production of hydrogen sulfide gas and also fosters huge colonies of Thiobacillus. This is simplified; there actually are many species of Thiobacillus that thrive in different conditions, and MIC usually is caused by successive populations of different species that ultimately create the conditions for the appearance of Thiobacillus concretivorous, which is Latin for “eats concrete.” This organism has been known to grow well in the laboratory while exposed to a 7% solution of sulfuric acid. This is equivalent to a pH of approximately 0.5. Simply put, Thiobacillus concretivorous eats hydrogen sulfide gas and turns it into sulfuric acid—it’s the acid that eats concrete, not Thiobacillus. In the drop shaft, the sporadic, intermittent nature of the heavy flows actually were a major part of the problem—they scoured off the accumulating gypsum layer several times a year and enabled Thiobacillus to keep attacking newly exposed concrete. The results were dramatic. The upper portions of the shaft had been eaten away about 2 in., and surface layers were mushy. Toward the bottom, more than 5 in. had been eaten away, walls were mushy and supporting steel was exposed and corroded. This was a disaster waiting to happen. Replacing the drop shaft was ruled out due to expense, so it seemed that mitigation would require some sort of T-lock lining or a coating—perhaps epoxy or polyurea. These were not appealing options. For starters, neither would address structural concerns, and on such a large structure, MIC mitigation was also a problem. It is easy and common for linings and coatings to develop small punctures or openings, caused either by poor installation or by wear after installation. A small opening is all Thiobacillus needs—the colonies can get started and grow behind linings, and do just as much damage as when they are exposed. In fact, they can do more damage—since linings and coatings hide the damage, inspections do not reveal problems until it is far too late. Fortunately, ADS Environmental Services (then Specialty Sewer Co.) approached the district with a new technology it had been researching—a spray-casting system and high-strength cementitious grouts developed by AP/M Permaform. For permanent MIC protection, the grout would be mixed with ConmicShield, an additive that bonds molecularly with concrete and inhibits microbial growth. The district decided this would be a suitable solution. It was cost-effective, could be completed in a short time frame, and promised to be effective both structurally and against MIC. Troweled smooth a final 1-in. layer after the entire wall was rebuilt to the plumb line. Afterward, the drop shaft looked like new with smooth walls, and it did not matter that the inner dimensions were reduced by 1 in.—the Maline Drop Shaft still has plenty of capacity. The shaft has been regularly inspected since then, sometimes by dewatering and lowering in a basket for visual inspection and measurement by a man equipped with confined-space equipment, and sometimes by lowering a sledgehammer in and swinging it from side to side—the banging tells workers that the walls are still firm and sound, with no MIC mushiness, and no faults are developing beneath the concrete’s top surface. At eight years, the district conducted a very thorough inspection and found that inner surfaces had eroded down by, at most, 3/32 in. At 18 years, it found no further erosion and no MIC damage, and the shaft walls are still smooth and sound. On the inside, the Maline Drop Shaft could be taken for a new structure. Getting the mixing proportion right is important. Lab testing of samples during construction also can be completed to verify that ConmicShield is present in the right proportion. Had those tests been available in 2000, the district would have used them. It also is important to note that ConmicShield is only effective for MIC; if corrosion by chemicals or another agent is the problem, some other solution will be needed. As it is, the district did everything right and has a flawless, like-new structure as a result. The district has used ConmicShield since that initial project. It is specified for all new concrete pipe in situations where MIC is a possibility, and it worked well in a tunneling project for a new 84-in. main sewer.